This palace is one of the most beautiful 3D modeling works that I ever designed in AutoCAD. Many people were impressed not only by the beautiful 3D renders, but also for excellent model geometry that makes it to look like 18-19th century neoclassic architecture. Interested to download AutoCAD .DWG 3D model file? Contact me and make a price offer. Remember: I spent over 100 work hours to design this digital art masterpiece. The interior design is simple and modern withou many decorations, to avoid overloading the drawing and crashing AutoCAD. Trees and window curtains are removed in these photos. Left: the 3D model in wireframe view, can you count the polygons and faces? 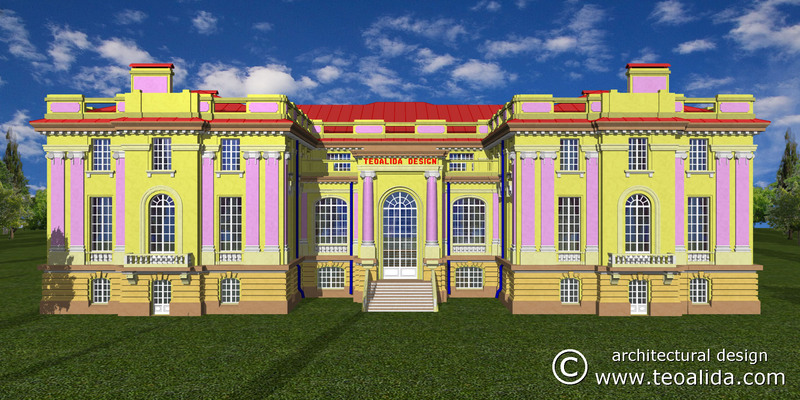 BUT….. they don’t know that this palace is NOT my personal conception, instead it is a 3D model of a REAL building, the Cantacuzino Palace “Little Trianon” from Floresti-Prahova, Romania, built in early 20th century and abandoned before being finished. My project was to design the palace in AutoCAD with maximum accuracy possible (unfortunately, without having original palace floor plans), so I did not wanted to go too far away from the original building design. Conservative politician Gheorghe Grigore Cantacuzino, nicknamed The Nabab for his immense fortune, member of the Cantacuzino family with a long-standing history in Romania, started to build a palace in Floresti village, 80 km north from Bucharest, intended to gift it to his niece, Alice. He hired the architect Ioan Berindei to design a palace similar with french palaces: the shape and height are inspired with Petit Trianon palace, while the architectural style and wall decorations are inspired with Grand Trianon palace. This nicknamed the Cantacuzino palace as “Little Trianon”. Construction starting date is somewhere between 1907 and 1912, different sources says different years. During World War I, the roof was damaged (cause and extent of damage is unknown, probably limited to pitched roof and not floor slab). In 1913, Gheorghe Cantacuzino died without being able to complete the palace, their children did not had enough money or were not interested to finish the palace, so very little work was done between the two World Wars, a period in which the palace was used as a warehouse. All walls and external decorations were finished, but inside only few rooms were finished, the windows were not installed and probably the stairs were not built too. Nobody lived in it, NEVER! At the time the palace was built, were no earthquake engineering norms in Romania. All walls are made by bricks without any reinforcement and were covered with sculpted granite blocks on external facades. Concrete was used only in arches above windows and doors and few internal walls. This offered NO protection against the deadly earthquakes that occur in Romania every 30-40 years. However, the palace survived well the 1940 earthquake. After World War II and installation of communist regime in 1947, the Cantacuzino family had to flee away from country to retain its wealth, and the palace remained in the care of nobody, water infiltration affected the abandoned structure. During communism times, the Cantacuzino grounds have been used by various people including an army camp, a tuberculosis hospital established in the nearby, older houses of Cantacuzino family, the hospital remains until today. The 1977 earthquake caused collapse of four 20 tons chimneys, fifth chimney remained standing, the falling chimneys destroyed some of the internal walls. While talking with few local people, some told me that the roof slab was already destroyed before the earthquake, in a test of explosives done by the army camp during 1950s, while others told me that prior earthquake there was still possible to climb to the roof. Several movies were shoot in the ruined palace during 1970s and 1980s, further aggravating destruction. I wish to know the name of movies, a search on YouTube may reveal how the palace was looking before the destruction. But the major destruction occurred only after 1989, after fall of communist regime, when villagers from Floresti and not only, vandalized the abandoned palace by destroying almost all internal walls and floor slabs, as well as a part of external wall was destroyed in 2006 (the wall behind columns on western facade), to steal bricks, marble and granite for their homes, also to get steel beams used in floor slabs and sold them as scrap metal. Plans of restoration were made since 1980s, but the nearby hospital scary potential tourists and keep investors away. Even the country president Nicolae Ceausescu intended to restore it. Since there are over 100 meters between palace and hospital buildings, a wall can be built to prevent patients entering into palace grounds and spread disease. The restoration may be still possible, but is estimated to cost about 20 million euro, a risky investment that could be hardly recovered. Around Romania there are a lot more historical monuments and heritage buildings, that despite of being structurally intact, require less investment and can generate higher profits due to their location on waterfront (for example Constanta Casino – video inside), are ignored by authorities and left to self-destruction. 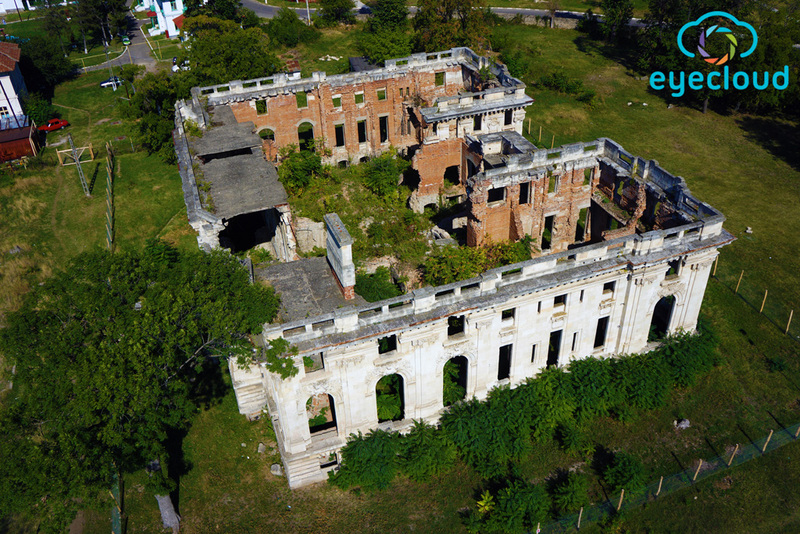 Thus, the chances for the Floresti palace to be restored to original conditions are very small. Let’s hope it will be at least converted in museum, reinforced to make it safe for visit and to prevent further damage or theft. Great news! The palace was given back to Gheorghe Cantacuzino’s grand children, who sold in 2009 to Radu Tudorache, Google consultant in Romania. In 2012 a fence was built around it to limit people access into it. In 2013 some works started, scaffolding were installed, unstable bricks were removed… but nothing else. Thee is unclear if they intend to rebuilt it or just to conserve ruins. The Cantacuzino Domain in Floresti is spawned over 150 hectares (3 km long along Prahova river). It also include seven smaller buildings built around 1830-1850, still maintained and housing a tuberculosis hospital, plus one church, and a water tower built also in 1830s, not maintained but almost intact, which offered a panoramic view to Prahova valley, until the concrete spiral stairs collapsed during 1990s. The property was a huge park containing a lake with an island, rivulets, aqueducts, several carved reinforced concrete bridges made to resemble wooden bridges (one bridge is almost intact, photo below), paved alleys with rare trees, greenhouses, hunting grounds, golf courses, and horse riding grounds. Around Romania there are at least 10 palaces and manors wearing Cantacuzino name, built between 16th and 20th century by branches of same family, most of them are in same or worse destroyed state. The Floresti palace is the most impressive from architecture point of view. I post there some photos with the remains of the palace, selected the best photos uploaded by people on Panoramio, credits to their authors. I also made myself about 100 photos in 2006-2007 but my photos are very bad due to cheap photo camera and low photographic skills. I live in Ploiesti, 20 km away from the palace location. 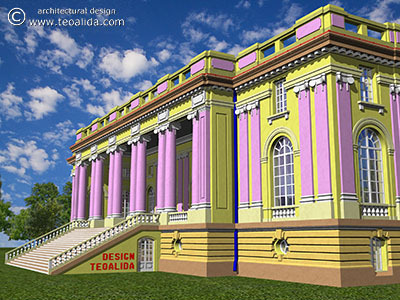 I discovered and visited the Floresti’s Trianon Palace first time in 2003, I was 14 years old and I liked the palace so much and I even had a dream in which I restored it and used it for my home, but being just a little child, I could not anything else than a virtual reconstruction in AutoCAD. In 2006 I visited again the palace, this time with photo camera, paper and measuring tape. I measured every piece of wall, even the chimneys (the collapsed ones, I do not risked my life to climb towards the roof). I made several sketches on paper plus about 100 photos of every wall. When I arrived home I started to redraw a 3D model in AutoCAD, this time high-detailed form compared with 2003 done by memories only. Note that all these drawings were done solo for pleasure of the art of 3D modeling in AutoCAD and were not intended to be used for any restoration project. Maybe I liked more to design the Parliament Palace, Peles Castle or other well-known palaces, but in case of Floresti’s Trianon palace, being abandoned, I was free to explore and do anything I wanted. In 2009, after buying a new, powerful computer (2 GB RAM instead of 512 MB), I done few small design improvements and rendered 15 images, to post them on my website and replace the original 2 images. In 2014 I done the first major redesign of the palace 3D model, to bring it to current skills of AutoCAD drafting and 3D modeling, and use it to promote my architecture design and 3D rendering services. I changed textures, added trees in landscape, added more geometric elements and corrected few mistakes done in the original design. Thanks to few friends, architecture students, who visited the palace armed with a laser measuring tool, able to do more precise measurements than me with a 3-meter measuring tape. Even if the palace is heavily damaged, the almost intact external wall and basement level show well the palace floor plan, so I am sure that my design respects 99% of the original design in terms of room layout, but most of internal doors are hypothetical. Although from outside the palace does look like a symmetric building, the internal layout have several mysterious differences between north and south sides, which intrigue me what was the purpose of each room. The absence of glass fragments (other than beer bottles) suggest that windows were never installed. Unlike French palaces having flat roof, the Floresti palace had a copper roof with a pitch of 1:3, this is visible on chimneys, but is unknown if the roof was plain or had eye windows, or if the attic space was used in any way. Between the axis of external walls, the palace is 43 by 35 meters, the face of walls (excluding decorations) is at 30 cm offset from wall axis (40 cm for basement walls), the roof cornice overhang 1 meter from wall axis. The palace gross floor area is about 4000 square meters distributed on 3 floors. It have 120 external doors and windows, and 50 internal doors (this is the number of windows in my AutoCAD drawing, I cannot know how many doors were in original palace). The center of palace seems that have been a great ballroom sized about 370 square meters (25 by 14 m) and double volume tall, with 5 doors opening to the great western terrace with 10 columns, facing to fountain, park and lake. A second double volume room is in the north-west corner, about 100 sqm, possible dining room. At the corners of great room, there are two rooms small as 5 by 3 meters, double volume too, as there is no evidence of floor slab where it shall be. This indicate that these rooms were intended for staircases, the basement floor plan also confirm that the basement was accessible through this place, but I did not saw any debris that resembles a stair, so I guess that the internal stairs were never built. The great western facade with columns does have evidence that a 15-meter wide stair was planned to lead to fountain, but the lack of foundation suggest that this stair was never built too. The palace floor plan is completed by 20 big rooms (ranging between 18 and 60 sqm, possible bedrooms, library, office, other day rooms) and many small rooms (less than 15 sqm, possible kitchen, bathrooms, servant rooms, etc), plus hallways. Most of palace walls have a thickness of 60 and 40 cm. – The color scheme, inspired from Paris palace, the Floresti palace was entirely white. – Windows frames, again inspired from Paris palace. – Staircases, there is no evidence that either internal or external stairs were built, so I added them from my imagination. – The 3 windows on upper floor towards eastern terrace are added from my imagination, that wall collapsed in 1977 earthquake or earlier. – I deleted one chimneys (the only one standing) to enhance symmetrical look. – Some wall motifs are missing in my 3D design because drawing them is too hard to impossible, also the 3D model is already complex enough to make AutoCAD software to crash often. See also: Palace Trianon Floresti in The Sims 2 version.